How have we been open to truth and how has our meeting guided and stimulated us? At the end of the first decade of the twenty-first century after the birth of Jesus, what do we offer to our families, our community and our world that speaks to “that of God” in each of us? Our spiritual community has been deeply enriched by the work and messages from our interim pastor, Andrew Grannell. Our Pastoral Search Committee worked diligently and deliberately to call the best qualified Friend to our midst, Daphne Clement. Our Youth Minister and her able assistants provide a rich array of resources and opportunities to our beloved youth. They made a field trip to Philadelphia, worshipped with our Shaker neighbors and visited the Heifer Project. Attendance at Sunday School, Youth Passages and adult religious education has been consistent and strong. The Woman’s Society has been active, raising more money in their annual yard sale than ever, and thus has more to give away. Our worship time is enlivened by the gifts of music, ministry and silent waiting. We offered Quaker Quest to our neighbors to let them know that they are welcome among Friends. We have been ably led by our co-clerks, and the faithful stewards of all our gifts, spiritual, financial and material. We have completed extensive work on our buildings, making them more energy efficient, welcoming and as well ordered as resources allowed. We welcomed new attenders and mourned the passing of several of our members who were inspiring in their lives of grace and faithfulness. We grow older and bolder, but take time to offer each other fellowship and support in times of illness and duress. We know the power of love and tenderness and have heard repeatedly the calls to forgiveness. We need to take the love and concern we experience in our meeting and pour it out in the rest of our lives. 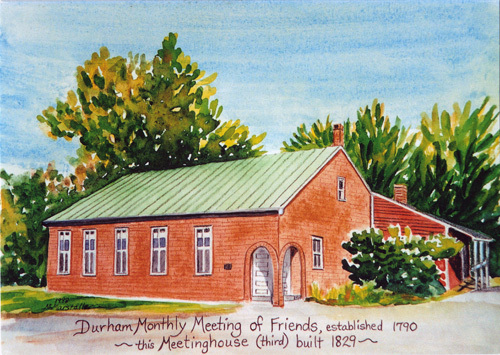 We have benefited from the ministry of traveling Friends, from our deepening connections with our Quarter through Quaker Quest. We are distressed to find ourselves without unity in matters that speak directly to our testimonies and pray that unity with all Friends, everywhere, may be found. We rejoice in our connections to Kakamega, Cuba, Kaimosi and Ramallah. We wish to offer more to the needy in our own neighborhoods, to feed the hungry, shelter the homeless and clothe those in need. We pray for peace. We have found comfort in the metaphor of the potluck. Each of us brings what we are able, and we gather joyfully to share the bounty. It does not matter if we have little or nothing to bring, there is always enough. And being with each other, in light and laughter while giving thanks, is our deepest blessing. We are grateful.